On Sale Now! Free Shipping Included! 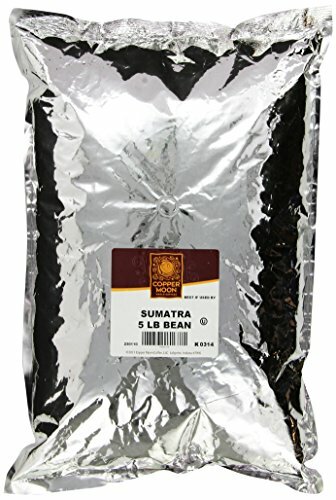 Save 6% on the Copper Moon Sumatra, Whole Bean Coffee, 5 Pound Bag, Dark Roast Coffee with Smoothly Bold, Earthy Flavors, and Herbal Notes by Copper Moon at Rat Coffee Shop. MPN: 230110. Hurry! Limited time offer. Offer valid only while supplies last. Copper Moon World Coffees invites you to taste the truly unique coffees of the world and explore the richest flavors these cultures have to offer. Copper Moon World Coffees invites you to taste the truly unique coffees of the world and explore the richest flavors these cultures have to offer. Copper Moon searches the globe to find the best beans the world has to offer and then carefully roasts them to perfection. WHOLE BEAN OR GROUND: Do you prefer to grind your own coffee beans fresh each morning for the perfect pour over, press pot or cold brew, or do you prefer the simple convenience of pre-ground coffee? Copper Moon Coffee has a variety of blends in both forms. QUALITY IN A CUP: Compare to coffee from VitaCup, Community Coffee, Full Circle, Peet's Coffee, Perfect Pod, Starbucks, Seattle's Best Coffee, San Francisco Bay Coffee, Marley Coffee, Caribou Coffee, Folgers, Dunkin' Donuts, Maxwell House, Green Mountain. If you have any questions about this product by Copper Moon, contact us by completing and submitting the form below. If you are looking for a specif part number, please include it with your message.